Happy Friday friends! Let me re-introduce myself to you. I am totally kidding, I have missed you guys! But, if you have been following us for a little while you know that I have been on and off the blog for a few months now due to some issues I have had with my heart. You can read more about it here and here. Two weeks ago today I got up and headed to St. Luke’s Hospital here in Houston and had an over 5 hour PVC Ablation done on my heart. Basically, the bottom of my heart was beating before the top of my heart prompted it to. This is turn caused to me have very irregular heart beats and made me not feel to good at all. 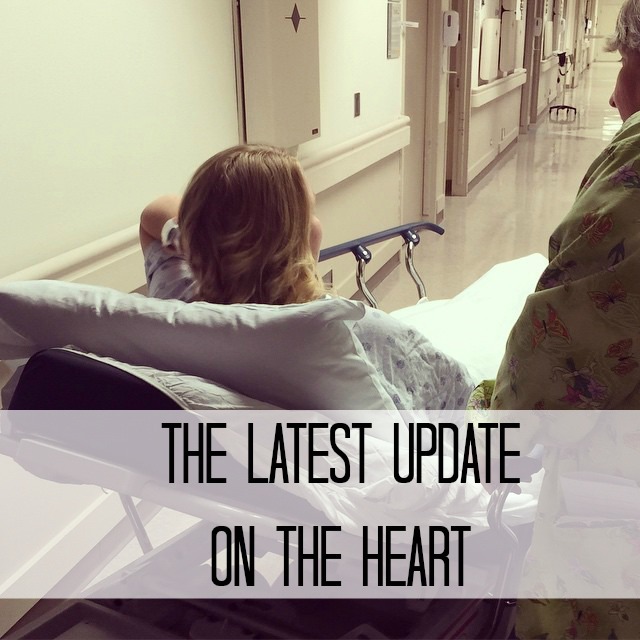 During my surgery my doctor located the spots in my heart that were causing the PVC’s and burned the cell. Once the cell was burned it essentially killed off that trigger spot and will hopefully never come back again. I am super excited to share with you that so far the surgery seems to have been a success. I am not feeling any PVC’s! The not so fun news is that these last 2 weeks have been rough. Before I had my procedure they informed me that I would feel awesome after. They said that I would feel like a whole new person and be ready to go. I have not felt super awesome. Bummer, right? About 20 minuets after I got back to my room from my procedure I started to feel dizzy and my eyes were very blurry. I saw cloudy spots everywhere. I had not eaten all day so I had a banana and soon things started to get less spotty. The only thing was that I still felt continuously “cloudy,” almost like I was still under anesthesia. My doctors assured me that it was normal and other than that I felt great. After a couple days of observation they sent me home and I was excited, still cloudy but excited. My cloudiness got worse again and after several hospital visits and doctors appointments everyone just kind of chalked it up to a very delayed response to the anesthesia in my surgery. I cannot even begin to tell you how frustrated I am. I was supposed to feel better after this. They were supposed to fix me and make all of this go away but instead I felt worse. I felt helpless and alone, I could not do everything I needed to for my kids, I was stuck laying down being stuck in a blur for days and I was losing my MIND! After a week and a half of this craziness I had enough and insisted on seeing my cardiologist. He listened to me. You have no idea what it did for me that they LISTENED to me. Something was wrong and I needed to know what. So, here I sit once again writing to you with wires strapped to me, feeling a little more clear everyday and praying that all of this really is just anesthesia and will continue to get better everyday. Through this entire ordeal I have had good days and bad days. I have had days full of fear and days strong knowing I am not alone and that God is carrying me. I have had days where I feel great and days where I cannot get off the couch. But, one thing that has remained no matter how I feel is His faithfulness. God has continued to show me His vast love for me. He has blessed me with family and friends who have sat with me for hours on end, loved on my kids like they are their own, prayed with me and just genuinely been there for me. Bottom line is, I am blessed. I am blessed beyond measure and I am oh so thankful. I stumbled across your blog just the other night by accident but of course I believe things happen for a reason! I just wanted to commend you for your strength and for showing your Faith in The Lord out loud!! I’m sorry this heart condition has challenged u, but please take it from another Faithfilled surviving mom of her own challenges ( post-partum), we can fing Strenghth thru Adversity!!! I pray that everyday is another day of healing and another chance to continue counting each of your Blessings!! And I admire you not just accepting answers given and following your instinct to seek more, we all need to advocate so much more for our own healthcare! You are fully equipped girl to fully recover by His stripes…bless u.
Danielle- thank you for your kind words. It is so good to hear from fellow Moms going through their own struggles. Definitely makes you not feel alone. Thank you for your prayers, they mean so much to me. And, thank you for reading. We love that you are apart of this community with us. Channing that is so frustration! I’m praying for complete healing for you! I can’t imagine how frustrating that must be! Actually, I can….my first endo surgery was like that. I was told I’d feel all better but suffered for months before getting answers and had to switch doctors 4 times before finding one who’d truly listen. Why won’t they just listen?!! So glad your doc is taking you seriously. Praying for answers, health, and peace for you!